In Movienizer, you can download information not only about movies but also about persons: directors, screenplay writers, actors, musicians. Typically, several photos, a biography, some facts, and the complete filmography are downloaded. Depending on where you download information from, some details may be different and in different languages. By default, filmographies are sorted by year, the latest movies shown first. However, you may want to change this. For example, to sort filmographies by title. Click the "Settings" button under the list of the available interfaces. This opens the settings window for the currently selected user interface (in our example, it's Breeze). 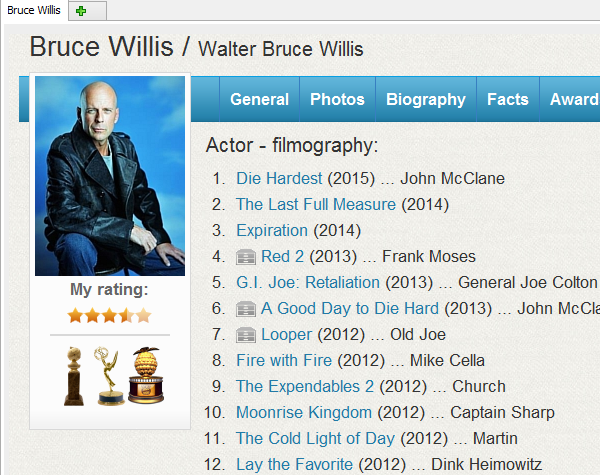 Look for the "Show sorting icons" option in the "Filmography options" area. Enable the option. 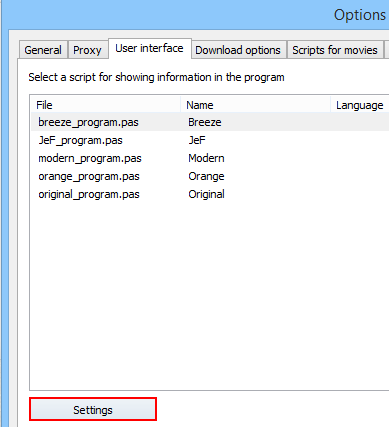 Confirm your changes with "OK", then close the settings window of the program. The icons allow sorting filmographies by title ascending (A through Z) or descending (Z through A) and by year ascending / descending. Your choice is remembered by the program and will be used for subsequent sessions, unless you change it. The icon for the currently selected sorting method is not displayed. On the screenshot above, we can see that the movies are sorted by title ascending, and the A->Z icon is not available. 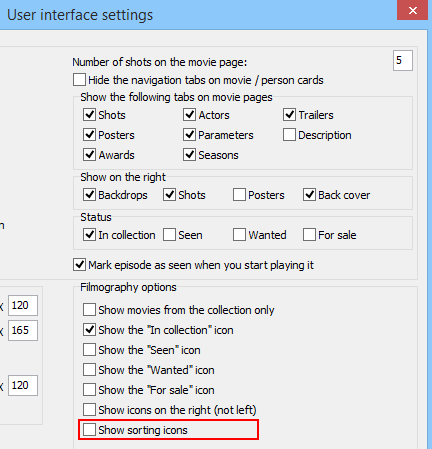 In the interface settings, you can also choose to show only movies that you have in your collection instead of showing the complete filmography.